Arrange oven rack in middle position and preheat oven to 350°F. Line muffin tins with paper liners. In large bowl, whisk together flour, baking powder, and salt. In small bowl, combine milk and vanilla. In bowl of electric mixer fitted with paddle attachment, beat together butter and sugar on moderate speed until light and fluffy, about 5 minutes. Reduce speed to low. Add 1/2 of flour mixture and beat until just combined. Add milk mixture and beat until just combined. Add remaining flour mixture and beat until just combined, then raise speed to moderately high and beat 10 seconds. Transfer to large bowl. In clean bowl of electric mixer fitted with the whisk attachment, beat egg whites until they hold stiff peaks. Fold 1/3 of egg whites into batter to lighten. Gently fold in remaining 2/3 of egg whites until just incorporated. Fill cupcake liners 2/3 full. Bake until tops are springy to touch and testers come out clean, about 20 minutes. Cool cupcakes in pans on racks 30 minutes. 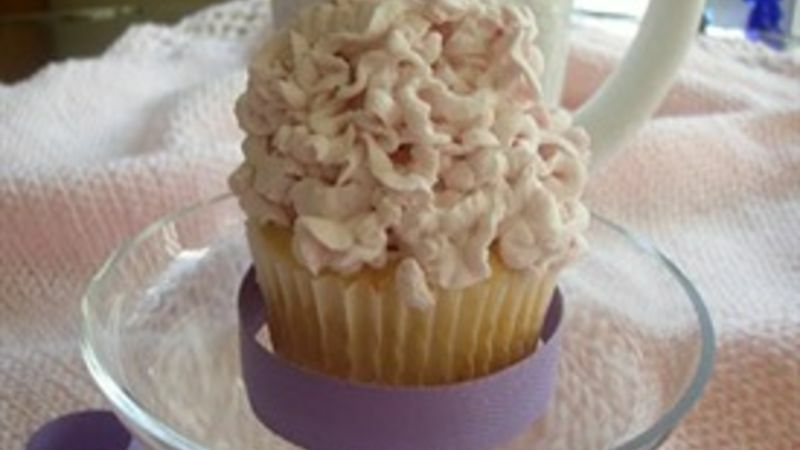 Directions for Whipped Cream Frosting: Whip heavy cream until soft peaks form. Add confectioners' sugar and whip until stiff peaks form. Gradually add powdered sugar, beating until smooth. Cut cone shape from each cupcake. Fill with 1 teaspoon of Sweet Potato Butter. Pipe on frosting.